We recently visited Darren Waterston’s Filthy Lucre, an art installation at the Smithsonian Freer/Sackler Gallery based on the Peacock Room and the related conflict between James McNeill Whistler and Frederick Richards Leyland. Core to the installation is the “Peacock Room Remix”, a twisted clone of the original Peacock Room, altered, smashed, shattered, bent and broken. 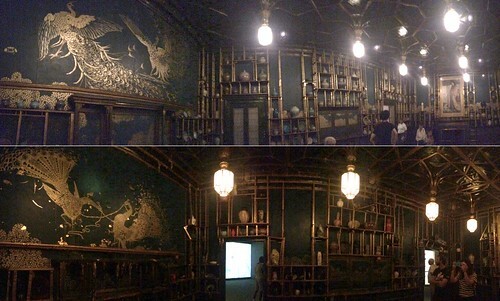 I tried taking panoramas of both rooms to show the differences. My pano doesn’t do the Remix justice, however. It’s an immersively unsettling experience to be there — and not just because you have to be careful not to step on the broken porcelain. I think the Smithsonian should totally acquire “Filthy Lucre” for their permanent collection and just randomly swap out the original Peacock Room with the Remix at random times of year.